The luxurious Hyatt Regency Chennai is located on the iconic Anna Salai (Mount Road), a 20-minute drive from Anna International Airport. Offering a 24-hour business centre, it also has an outdoor pool and pampering spa treatments. The inviting and spacious rooms are come with a 40-inch flat-screen TV, iPod dock and a well-stocked minibar. En suite bathrooms have a large soaking tub and separate rainshower. 24-hour room service is available. 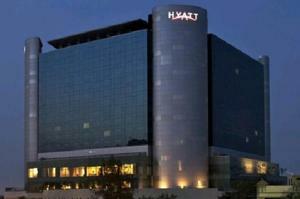 Hyatt Regency Chennai is a 5-minute drive from shopping at Nungambakkam and T Nagar. It is within a 20-minute drive from Chennai Central Railway Station, Rajiy Gandhi Salai and Chennai Trade Centre. Siddh Spa provides private treatment rooms where guests can indulge in relaxing body massage and facials. The fitness centre features personal trainers, steam rooms and saunas. Indian and European dishes are served at Spice Market, while coastal flavours of Southern Italy are offerd at Focaccia. Other dining options include Asian and Chinese food at Stix, as well as chocolate and pastries at Biscotti. Drinks can be enjoyed at 365 A.S. Bar and the 24-hour Lobby Lounge. Free! All children under 6 years stay free of charge when using existing beds. One older child or adult is charged INR 1000 per night and person in an extra bed. Maximum capacity of extra beds in a room is 1. There is no capacity for cots in the room. Any type of extra bed or child's cot/crib is upon request and needs to be confirmed by the hotel. Supplements will not be calculated automatically in the total costs and have to be paid separately in the hotel.